"ADOS" stands for Adjustable, Double leg, Oblong master link & Sling hooks with safety latches. 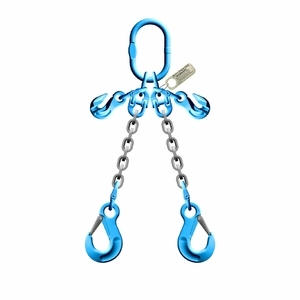 These Grade 120 chain slings feature an oblong master link on one end and two latched sling hooks on the other end. These are ideal for use off of a crane hook and having two pick points allows for greater load stability. This adjustable chain sling model also allows for level, balanced lifting of loads with staggered pick points or unbalanced centers-of-gravity.